Using holdfasts to hold a piece of walnut for rabbetting the edge. Why go beyond the vise? Most workbenches have some kind of vise for holding workpieces. A good vise is invaluable, but it's not the whole story. There are some operations or workpieces where it just doesn't work well. Things only get more frustrating if you don't have a good vise. Some are totally inadequate. And what do you do when working at a project site or some other remote location away from you main bench? Woodworking is thousands of years old. Various workholding methods have been handed down across the generations, but many have faded into obscurity. In my Popular Woodworking University webinar Beyond The Vise, November 5 at 8:30pm EST, I'll part the mists of time and show you how to use them in your work (a recorded version will be available if you're unable to be online at that time). These are time-tested methods that are simple and efficient. Effective work holding makes your work faster and easier. And less frustrating. One of my favorites is pictured above, the holdfast. This is an example of modern evolution of an ancient method. These Gramercy Tools holdfasts are made in a patented process from modern bridge wire ("wire" takes on new meaning when you're holding up something like the Golden Gate bridge). But blacksmiths have been making them for woodworkers for centuries. The essence of simplicity, they just work. Slipped into vertical or horizontal dog holes, you whack them on the head to set, and whack them behind the head to release. You can hoist an entire workbench into the air with a holdfast set in the top. The general requirement for work holding is that you need to be able to hold pieces for face, edge, and end grain work. This includes planing operations of all kinds, sawing, and chiseling, for stock preparation and joinery. The tools apply force to the work in specific directions, so you need to restrain the workpieces against those forces. A plane directs force down the length of a board. Planing on a diagonal adds sideways force. You need to keep the work from sliding forward or sideways. Some tools also apply force on the return stroke. A saw cuts on the forward stroke, but there's enough friction in the kerf that pulling it back on the return stroke pulls on the workpiece. So you need to restrain it against both forward and backward forces. It's tempting to want to lock down the work against all possible motion, since that's what a vise does. The workpiece is restrained against movement in three dimensions, up and down, left and right, forward and back. However, that's often unnecessary, and leads to time-consuming steps getting the piece locked down. Then you take more time to loosen it up and tighten it back down when you need to reorient it or swap it out with another one. It's much more efficient to minimize the restraints to just the actual forces that will be applied, leaving the piece loose in other directions. Then you can instantly reorient it or swap it with the next piece. The time savings add up. The work flows more smoothly. Round dog holes in my workbench give me lots of choices. In addition to holdfasts, I use simple dogs and pegs in them, plus a variety of more specialized stops. I like to use battens as planing stops, particularly ones fitted to the dog holes so they can just drop into place. I use bench hooks for fine sawing, and apply this concept to planing boards. Add a couple more items, and you have a versatile set of work holding methods capable of handling any situation. 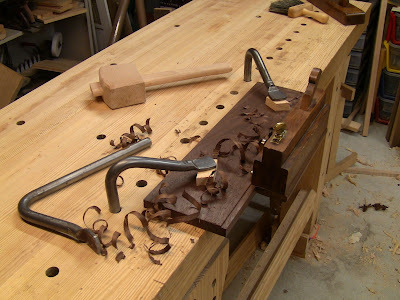 I use three workbench designs in my work: Chris Schwarz's Roubo with leg vise, Paul Sellers' bench with Record-style quick-release face vise, and Roy Underhill's portable bench with no vise (what, no vise?!?). I've also taught classes in rooms with nothing but bare worktables (what, no vise, no dog holes?!?). I'm able to get the same work done on all of these by adapting my workholding strategy to the setup at hand. The latter was the most challenging, for which I created a space-age portable work surface adapted from a number of traditional methods. Since there was a left-handed student, I made one in a left-handed version. You can see all of the methods I use here in various posts, but if you'd like the concise summary, sign up for the webinar. It'll make your hand tool woodworking faster, more effective, and more efficient. I'm not anti vise but.....stops, battens and holdfasts along with an older English QR face vise is about as good as it gets for my work. My latest bench only has a face vise set off the bench by the width of the chop and dog holes for battens and holdfasts, if I build another I expect it will be the same with no changes. Folks over think benches and work holding. As you posted, for many operations if not most, vises slow you down and can introduce error if you are not careful.